Commissioner: Lamees Hamdan. Curator: Reem Fadda. 28 May – Venice, Italy, The National Pavilion of the United Arab Emirates (UAE), under the patronage of the Ministry of Culture, Youth and Community Development and with the support of the Sheikha Salama bint Hamdan Al Nahyan Foundation, presents “Walking on Water” for the 55th International Art Exhibition – la Biennale di Venezia. Curated by Reem Fadda, “Walking on Water” features a solo exhibition by Emirati artist Mohammed Kazem under the leadership of Commissioner, Dr. Lamees Hamdan. 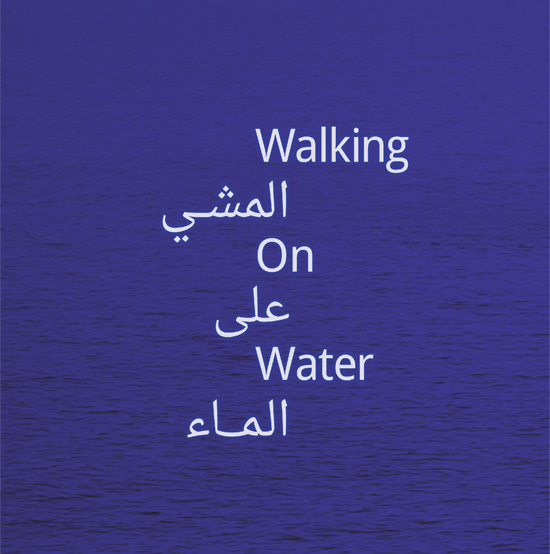 Walking on Water presents “Directions 2005/2013”, a specially commissioned immersive installation, by Mohammed Kazem, of a 360-degree projection of the sea within an enclosed chamber. The artwork recreates the experience of what it is to be lost at sea and, symbolically, to break down geographical borders and intangible barriers between people. By putting the viewers off-balance, Kazem engages them both conceptually and physically with his work, thereby inviting them to question and challenge their perceptions of openness and universality. “Borders are imminent realities in our current ‘global’ age. Despite progress and acts of modernization, our world remains hindered with the ideas of boundaries and restrictions. Openness remains one of the phantasmal and illusive ideas of our times. The conceptual trajectory of Mohammed Kazem’s practice has constantly been to confront boundaries and limitations, be it material or natural. These symbolic acts of breaking shackles and inhibitions are his way of asserting his humanity and existence. Through intuition and deliberation, he investigates the natural and physical restrictions, especially those of the sea, to not only question but also assert the right to roam free; spiritually, conceptually and materially,” explains curator Reem Fadda on her selection of this work by Kazem. Kazem makes use of artistic elements and methods that he has been working with for over 20 years, including drawing, light, color, photography and video, to create an experiential installation. Kazem worked with iGloo Vision and Complet Films to realize this work. “Directions 2005/2013” was conceived and exhibited in 2005 as a maquette, but wasn’t realized due to financial and technical complications of producing such a large-scale work. Part of a much larger body of work, Directions is arguably Kazem’s most emblematic conceptual series. In it, Kazem mainly utilizes Geographical Positioning System (GPS) coordinates to symbolically document his location. These coordinates have become an iconic trademark of his practice. Begun in 1999, the Directions series has continued to evolve for over a decade, all the while seeking to address political, sociological and personal issues related to his environment. Fadda is currently working as Associate Curator of Middle Eastern Art – Abu Dhabi Project at the Solomon R. Guggenheim Foundation based in New York. She is also a PhD candidate at the History of Art and Visual Studies Department at Cornell University. Fikra is a multidisciplinary design studio specializing in bilingual graphic design: Arabic and English. Founded by Salem Al-Qassimi in 2006, Fikra works across a variety of media, time-based and print including book design, data visualizations, environmental graphics and bilingual typography. la Biennale di Venezia has marked an important milestone in its long history by awarding the United Arab Emirates, the first Gulf National to participate in the Art and Architecture Biennale, with a long-term hospitality agreement (permanent pavilion) in the Arsenale – Sale d’Armi. The agreement was finalized through the United Arab Emirates Ministry of Foreign Affairs. la Biennale di Venezia is world-renowned for the biannual International Art Exhibition and Architecture Exhibitions, as well as the International Film Festival, and continues the great tradition of the Festivals of Contemporary Music and Theatre, now flanked by the Festival of Contemporary Dance. The third iteration of this specialized program was launched in November 2012. The specially selected candidates were drawn from the across the UAE through a nation-wide recruitment campaign. After a rigorous screening and interview process, the selected fellows are now participating in an extensive training program aimed at enabling them to engage fluently with the content of the exhibition in Venice. This year, the Venice Internship Program is partnering with the prestigious Ca’Foscari University in Venice, which facilitated the inclusion of six specially selected Italian interns working side-by-side with the Emirati fellows. This partnership has been developed to foster a true exchange of cultures between the interns and to allow Emiratis to engage further with Italian customs, language and knowledge thus enhancing their local experience in Venice. You can follow their developments and their blog posts on the Venice Internship Program Blog: http://uaepavilion.wordpress.com/.